Since the beginning of warfare military leaders knew their greatest chance of winning on the battlefield is to know where the enemy is, how great in strength and what they were planning to do. It was certainly no different with Vietnam commanders. 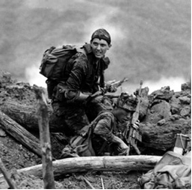 To gain useable and timely intelligence on local enemy forces, Vietnam infantry commanders created “unauthorized” or off the book reconnaissance units to penetrated deep into enemy-held territory. So successful were these forays by these small, well-armed Long Range Reconnaissance Patrols (LRRPs) that General William Westmoreland approved the formation of a LRRP unit in each infantry brigade or division. But there was one reconnaissance unit operating in Vietnam several years before LLRP units existed. It was Project Delta, a clandestine special reconnaissance operations considered the most successful Special Operation units of the Vietnam War, yet few Americans have ever heard of them, or know that this unit’s operational model was precursor for the renowned Delta Force. Established at Nha Trang in 1964 the mission of Project Delta (officially designated Detachment B-52) was to conduct special reconnaissance missions throughout Vietnam when ordered by COMUSMACV and the Vietnamese Joint Central Staff. Mission orders generally followed requests for assistance by division or larger commands. Project Delta would then fall under operational control (OPCON) of the requesting unit. Missions were as many as they were varied including operational and strategic reconnaissance into long held Vietcong areas to collect intelligence for tactical or strategic exploitation, direct air strikes on normally inaccessible targets or when a heavy concentration of an enemy was spotted, conducting BDA (Bomb Damage Assessment) in enemy controlled areas, inserting hunter-killer missions at night using helicopter borne personnel with sniper scopes and Starlight scopes, recovering allied POW’s and downed airmen, capturing enemy for intelligence exploitation, tap into wires on enemy communications lines, plant mines on transportation routes, mislead enemy counterintelligence by using deceptive missions, mock ordnance devices, and dummy infiltrations, and conducting photo reconnaissance and psychological operations. The operations were near known enemy base areas and infiltration routes in the border areas. These operations remained classified until 1996. While the operational strength of B-52 varied and fluctuated during its history, typically it was comprised of 11 officers and 82 enlisted men from the U.S. Army Special Forces, a 105 man CIDG (Civilian Irregular Defense Group) Nung Security Company responsible for compound and TCC security, a Bomb Damage Assessment (BDA) team consisting of four US and 24 CIDG 20 officers and 78 enlisted men from the Vietnamese Special Forces, a 123 man CIDG Roadrunner Company and the 81st Airborne Ranger Battalion (RVN) made up of 43 officers and 763 enlisted men. The 81st Airborne Ranger Battalion was the reactionary force for Project Delta. 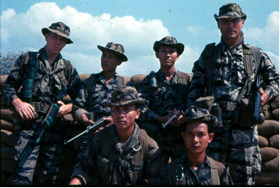 With the dire need for additional troops in Saigon during Tet 1968, the Airborne Ranger Battalion fought in Cholon and in the jungles northeast of Saigon. In most cases elements of the 281st AHC were attached OPCON for aviation support. Additionally U.S. Air Force personnel were assigned as Forward Air Controllers as well as Australian SAS and South Korea Special Forces personal. The Recon Teams (combined USASF and VNSF) and Roadrunner Teams (VNSF equipped with enemy uniforms, accouterments and weapons) were the primary source of intelligence collection for Project Delta. Insertion of these Teams for infiltration was accomplished in a covert manner by helicopter with techniques developed initially by the 145th AVN PLT and Project DELTA and refined by the 281st AHC. Extraction or exfiltration was accomplished in much the same manner as the insertion. After the Team was identified by means of pre-designated codes the recovery operation proceeded. Depending on the terrain, weather, extent of wounds and enemy situation, the Team may be extracted with ladders, McGuire Rigs or Electric Hoist. In later years the McGuire Rigs were refined into the STABO Rig. 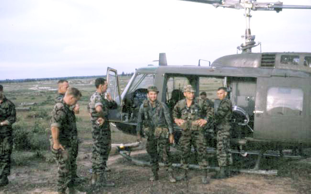 If the LZ was hot and the Team was in contact, the Team was usually extracted with the McGuire or STABO and flown to a secured area to be recovered into the aircraft. During its history, Project Delta identified 68 enemy units, captured vast amounts of equipment and supplies and identified many major enemy installations and supply routes. Enemy losses attributed to B-52 during its operations include 338 KIA, 25 WIA and 69 POWs. 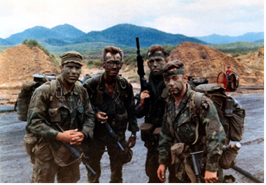 Operating in even combat tactical zone in Vietnam, it was OPCON to the 25th Infantry Division, 1st Cavalry Division, 101st Airborne Division, 4th Infantry Division, 3rd Marine Division, and the 5th ARVN Division as well as Company A, 5th Special Forces Group. After conducting 55-60 separate operations, Project Delta ceased operations on June 30, 1970. 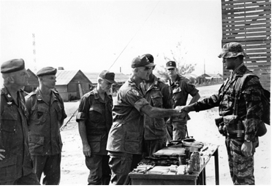 Never numbering more than 100 officers and enlisted men at any one time, it would become the most highly decorated unit of its size in the Vietnam War. Among the many decorations Detachment B-52 soldiers received were two Distinguished Service Crosses, 18 Silver Stars, 58 Bronze Stars with “V” devices and 53 Purple Hearts. 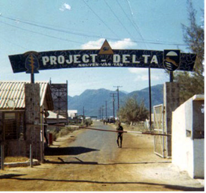 Project Delta was also the second most highly decorated unit in the conflict with the Valorous Unit Award, the Republic of Vietnam Cross of Gallantry, the Republic of Vietnam Civil Actions Honor Medal with Palm, and the Navy Unit Commendation Ribbon. Twenty nine former members of Project Delta are listed on the Vietnam Veterans Memorial Wall.